When I introduce myself as a food blogger, conversations seem to center immediately on restaurants. Indeed, in my survey trying to understand the archetypal food blog, I found that the restaurant experience seemed central to a lot of them. In fact, many consider food blogging an extension of the ancient (by Internet standards) art of restaurant critique — bloggers exist as an amorphous entity between and among formal critics and Yelp complainers. I make it a point that I do not review restaurant reviews exclusively. In fact, I am trying to understand the gist of what provides a favorable restaurant experience. So eloquently illustrated in the movie Ratatouille - the most powerful restaurant experience seems to tap into a private memory of the diner. And that is almost an impossible challenge for a chef, to understand and empathize, perhaps to educate, complete strangers expecting something designed for them. Which is probably why as the stakes go up, most restaurants become less daring. To hedge the bets, a restaurant tends to aim for the lowest common denominator. But dining is also an act of communication; reviewers often forget the social aspects of the dining experience that can overshadow nature the food itself. In that sense, the reason why so much writing focus is on restaurants is that it offers an asynchronous and a reproducible experience. It's the DVR of food, one need not only vicariously experience it, but a reader can go and recreate the experience. Here is my end of year list of memorable food experiences - my mix tape, to stretch the metaphor. Some of these will not easily recreated, but I share my memories in memory of the year past, and in anticipation of the year to come. 2012 opened with a delicious offering from Chef Steve Marques, at the time working at the Tasting Room Uptown, Houston. Here is his "best chocolate ice cream in the world" - luxuriantly nuanced with duck egg yolks, accented by thyme. Timeless. White ramen, Menya Musashi, Singapore. 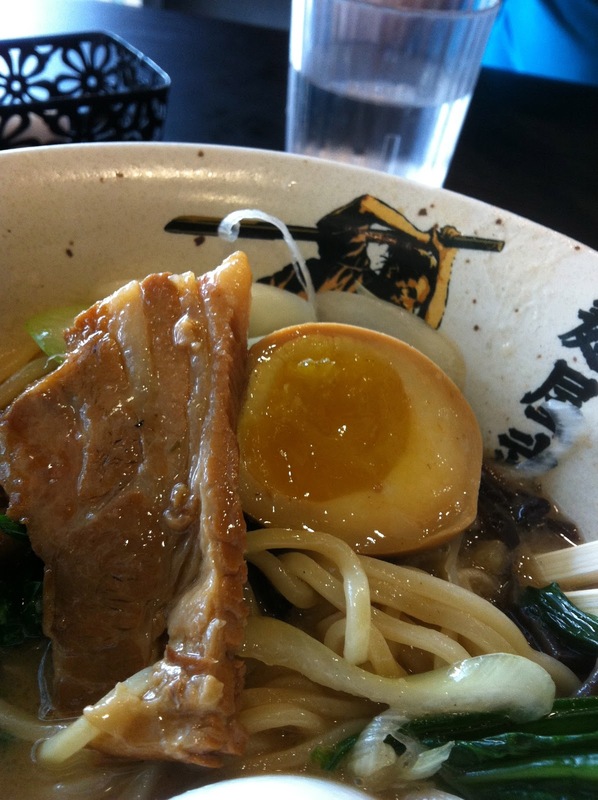 Perhaps the richest ramen broth I have ever encountered. Not the perfect ramen experience, but quite good. Bo ssam in the air. I wouldn't have thought that an airplane meal would count among the memorable dining experiences of the year, but Asiana Airlines proved me wrong. This savory and generous combination of pork belly and fresh herbs and leaves is a standard that would do well on the ground. On my visit to Santa Monica, CA, the most interesting food I had came from the varietals in the farmer's market. Here is a variety of tomato that was the sweetest I have ever had (it rivaled a strawberry). And the avocado was simply stunning in flavor and texture. Steve Marques also opened my eyes to the delicious decadence of chicken fried bacon, so much so that I had to try my own hand at beer battered bacon. Already showered with accolades, I must admit that Uchi Houston has finally come into its own. I think they carry the most interesting desserts in Houston, in a town so bereft of interesting dessert items. But I was treated to this nigiri sushi of meat off a flounder fin. Notoriously difficult to procure, comprising but a fraction of the flesh off the fish, this is a treat rarelyserved. 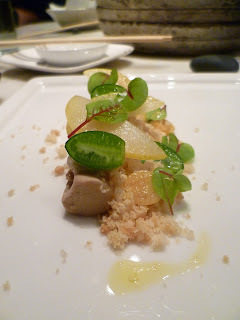 This torchon of foie gras with cucumelons and pear is one of the most amazing things I've tasted this year, and was also an offering from Uchi Houston. Both sweet and savory, it illustrates why foie gras is such a celebrated ingredient. While the food in Banana Leaf Malaysian food in Houston can be tepid, this crispy duck dish on curry is a must try. 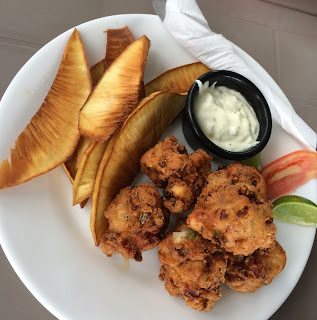 Practically boneless, it is expertly fried with an ethereal crust, and is complemented by complex curry sauce. Salted duck eggs are a surprise to those unused to these savory flavor bombs. I was fortunate enough to have this beautiful specimen earlier this year on a trip to Aklan, the Philippines. Not the very best possible, it's still heads and shoulders better than the shrink-wrapped specimens common in Houston's Chinatown. I tried to share some of the diversity of cuisine found in Singapore, so I'll just relay a few of the delicious dishes I tried there. 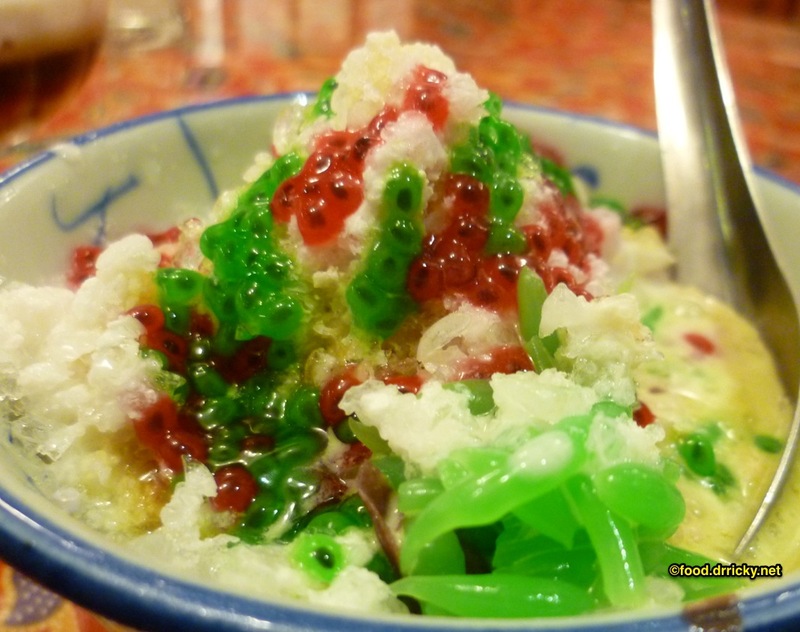 Here is a colorful bowl of cendol, tapioca noodles flavored with pandan, in a bed of ice with gula melaka. 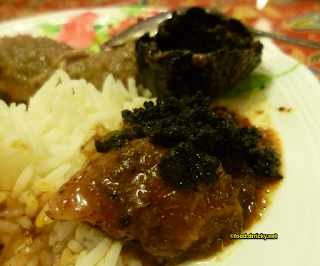 Then there's the iconic Peranakan dish of chicken cooked with buah keluwak. From the restaurant Chilli Padi. But really, few things are so memorable, so comforting, as charcoal grilled toast, smeared with the coconut custard kaya, and a slab of butter. 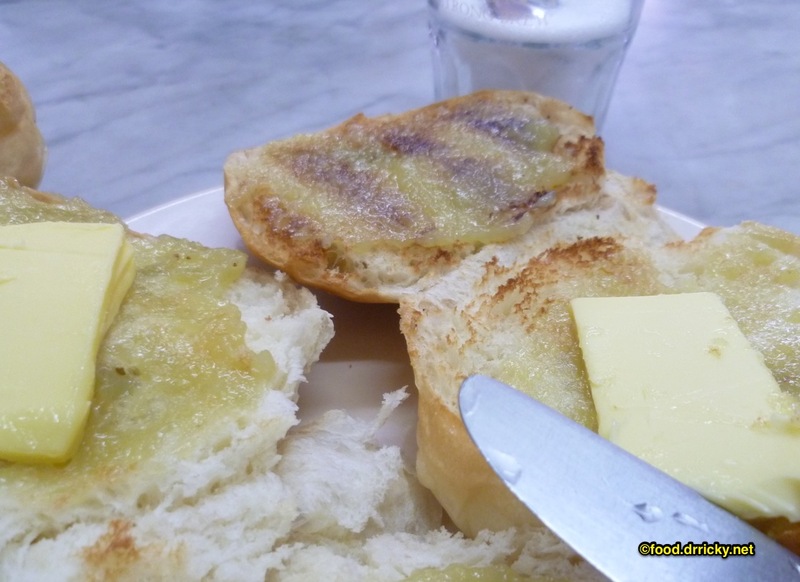 I still bake bread just to make kaya toast at home. It's worth it. There you have it. 2012 kind of whizzed by. Looking forward to a prosperous and delicious 2013.